Split the team into two equal groups with one goal keeper. Alternate between each side by 1, delivering the diagonal pass into the forwards feet and follow the pass. 2, The forward sets the ball and spins out around the outside of the Mannequin, Player, Pole or Cone. 3,The supporting player feeds the ball into the forwards path who then finishes using a variety of styles (Set your own rules.) Passer replaces the forward, the forward replaces the ball boys who joins on the back off the group. Alternate and repeat. Make sure you have plenty of balls to keep session flowing. 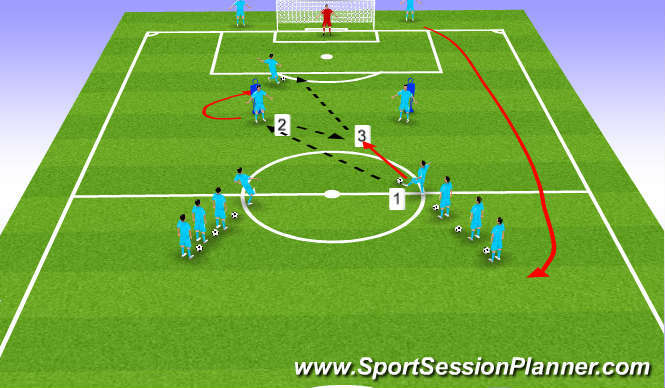 Progressions Add defenders, extra attackers, wide players and both forwards play of the one pass. Key Points Encourage quality and accuracy emphasising the game related scenario.